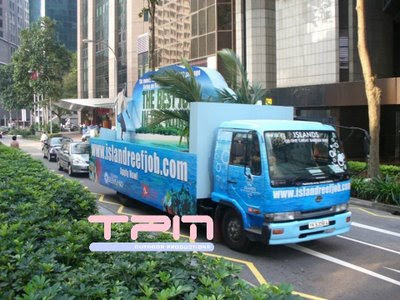 TPM Outdoor deployed a 22-footer truck fitted with a double-sided billboard display which moved everywhere and at anytime around in Singapore. It is very effective for reaching the target audience such as the youth, IT oriented and road-warrior/ mobile people. Due to the large creative canvass available, our mobile billboard is highly novel to any campaign efforts. There is ample space avaliable to execute full props decoration and installation of 2D/3D. Our design of the backdrop/ billboard display itself is optimised to provide maximum visibility. It is also highly mobile and can reach almost all roads; the display can be parked at most car park lots. 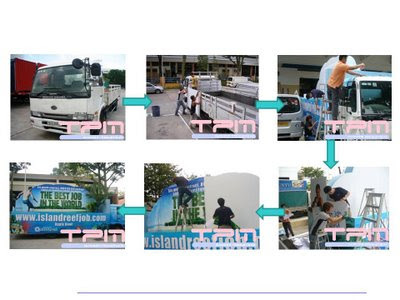 Why Is A Mobile Billboard More Effective? In our cluttered environment, this is truly and out-of-the-box Out of Home Advertising display that really jumps out. It is attention grabbing thus being able to target the young and IT savvy which spends a lot of time outdoor. It is really the right form of mobile billboard for mobile people. It also helps to reach the exact right places such as at the university or beach areas. 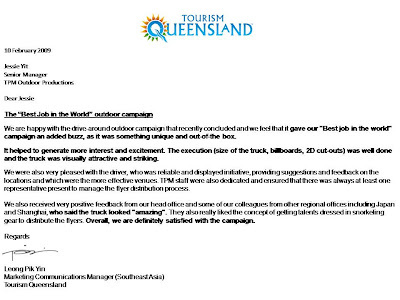 Even as digital media grow online, there is still a strong need for balance in some form of offline advertising in the outdoor context and this mobile billboard may enhance any online efforts/ or marketing of IT related products such as in our recent execution in the “Best Job In The World” campaign for Queensland Tourism. Why Use the TPM Outdoor Advantage? TPM Outdoor provided the one stop solution from planning, installation to execution including complete in-house production and project management; clearance of any authority requirements. We also provided optional items including billboard placement, talent sourcing and events management. Together with Posterscope South-East Asia as the outdoor specialist for this project, we worked together with the out-of-home specialist and client to customise a route that encompasses the Live.Work.Play. The Work and Study route : CBD Shenton way, Raffles Place, Orchard road, University; Play route: East Coast (Beach Area); the Live route at various Heartlands and also focusing at Jurong Point, Tampines Mall. Talents were also deployed at each rest-stop to help distribute flyers and further engaged members of the public. It was an overwhelming success to everyone. A first for the client, TPM and the current Out-of-Home Advertising scene in Singapore. The client also shared her thoughts with us on…. Thank you too - It has been our joy to be of service. See you in the outdoors again soon! Don't we all wish the goal posts are wider apart? Xenon Inkjet Printing based in Myanmar has set up a billboard in downtown Sule to feature their super wide format UV printing and there is no better way than to use a super stretch billboards of 90 feet long to feature this. 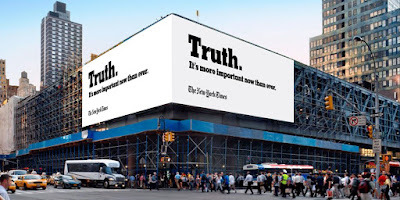 what struck me as interesting was that both the Adweek articles - "Trump Lashes Out at New York Times Ad Set to Air on the Oscars Tonight" and The New York Times Joins the Debate About the Truth in Minimalist Ads From Droga5" was that both articles used the billboard version of Droga5's stripped down campaign for The New York Times to head the article. The billboard message is strong, bold and says TRUTH. It is hard to get away with murky information when the billboard is anchored at the busiest cross junction in downtown New York City or anywhere in the world. That's the power and impact of using billboard advertising. Only starting its international expansion since 2014, Vivo smartphones has been rapidly internationalizing with their launching in India, Malaysia, Indonesia, Vietnam, Myanmar, and the Philippines then. Today their signature blue background advertising with their Selfie focused campaigns for the Selfie-loving consumers is found in major airports, secondary airports such as at the Sultan Abdul Aziz Shah Airport (Subang airport in Malaysia), ferry terminals, key traffic junctions of capital cities of these countries. The Perfect Media Myanmar executed a last minute billboard buy for Vivo Smartphone in Myanmar by advertising on an iconic billboard located in downtown Yangon at the junction of Sule Pagoda Road and Bo Gyoke Road. Well timed before the 2017 Thingyan festival, advertising during this period is well timed with heavy crowds and a celebratory mode.